May we dispel the three poisons. And light the lamp of wisdom. May we engage in the deeds of bodhisattvas. His Holiness recited verses of salutation to the Buddha from ‘Ornament for Clear Realization’ and Nagarjuna’s ‘Fundamental Wisdom of the Middle Way’. 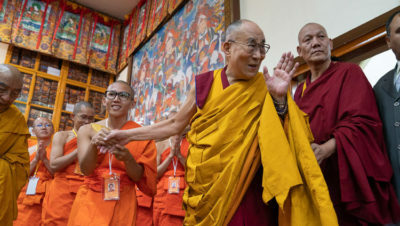 “Many people have gathered here from East and South-east Asia for this teaching,” he began as he looked out over the audience, “amongst whom are monks from countries who traditionally follow the Pali tradition. I greet you all. Taking up Buddhapalita’s commentary, His Holiness mentioned that Buddhapalita was a disciple of Nagarjuna and Aryadeva. He remarked that he had received explanation of this text and Chandrakirti’s ‘Clear Words’ from the former Ganden Throne-holder, Rizong Rinpoche. This text, Buddhapalitavrtti, is an explanatory commentary on Nagarjuna’s ‘Fundamental Wisdom of the Middle Way’. He observed that although monks in Tibetan monastic universities study the commentary, they pay less attention to the root text, ‘Fundamental Wisdom’. Noting that Chapters 18 and 24 are the most important, he recommended that a student might begin by reading Chapter 26 which discusses the Twelve Links of Dependent Arising which in forward and reverse processes show how ignorance binds us in the cycle of existence. To put an end to that, Chapter 18 explains how to overcome karma and mental afflictions, while Chapter 24 reveals how to understand emptiness. As he brought the morning’s session to an end, His Holiness recounted a dream Je Tsongkhapa had of Nagarjuna and his disciples and how Buddhapalita touched his head with this book. The next day Tsongkhapa realized emptiness on the basis of what he had understood from reading this treatise. His Holiness’s final remark was that it seems as if Buddhapalita, who declared that dependent arising is the main cause for gaining insight into emptiness, received both the explanation and transmission of this doctrine, whereas his co-disciple Bhavaviveka seems only to have been given the transmission. 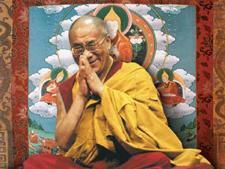 His Holiness will continue to read and explain ‘Buddhapalitavrtti’ tomorrow.